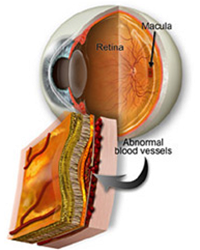 Services for Macular Degeneration from Eye Site Age-related macular degeneration (AMD) is the leading cause of severe vision loss and blindness among adults 65 years of age and over. It has become more common than Parkinson’s disease, Alzheimer’s disease, Breast Cancer and Prostate cancer combined. Age-related macular degeneration is a disease that damages the macula, the central portion of the area at the back of the eye called the retina. The macula allows for central vision and also enables color vision and the ability to resolve fine detail. The damage caused by AMD ultimately leads to central vision loss. In most cases, however, patients will retain peripheral vision. If you’re one of many who suffer from Macular Degeneration (AMD) in the Houston and Katy, Texas area, please contact Eye Site for more information on the eye condition and testing services from our caring Optometrist. In dry AMD, yellowish, fatty deposits called drusen develop on the macula. It is believed these spots are deposits or debris from deteriorating tissue. Dry AMD rarely causes severe vision loss; however as many as 20% of dry AMD patients will convert to wet AMD. Currently, there are no approved treatments for dry AMD, although some studies have shown that vitamins, antioxidants, diet, and smoking cessation can slow its progression. The majority of dry AMD patients have no symptoms, and an eye doctor may need to conduct a variety of eye tests to aid in the proper diagnosis. Yellowish spots (drusen) are an early sign of “dry” macular degeneration. 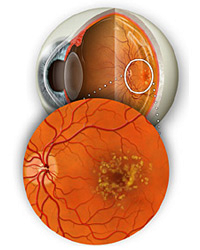 Wet AMD occurs when abnormal blood vessels grow underneath and within the macula. These newly formed blood vessels are usually very fragile and can leak blood and other fluids beneath the macula. This process can damage the macula and create areas of scarring. Due to the rapid onset of macular damage, a noticeable blurring or even loss of central vision are frequently the first symptoms a person may notice. The vision loss is usually permanent because abnormal blood vessels and scar tissue are actually destroying normal retinal tissue. Once lost, these light-sensitive cells in the retina cannot be replaced. If a person has wet AMD in one eye, there is a 35% chance that wet AMD will develop within the patient’s other eye within 5 years. The most important action to preserve vision is to establish a schedule of regular retinal re-evaluation by your eye care professional. Changes in vision should trigger immediate evaluation from your eye doctor. For patients over the age of 50 with a family history of AMD or smokers, routine yearly eye exams are highly recommended. Detection of the early signs of AMD is essential to help preserve as much of their vision as possible. Amsler Grid: An Amsler grid consists of straight lines, with a reference dot in the center. Someone with macular degeneration may see some of the lines as wavy or blurred, with some dark areas at the center. Digital Retinal Imaging: Digital retinal imaging records the appearance of the retina and can be very useful for documenting the change in the appearance of macula over time. Optical Coherence Tomography (OCT): OCT is an imaging method that uses ultrasound technology to provide detailed cross-section images of the retina and its underlying layers. This non-invasive and sensitive technology has become one of the gold standards for monitoring retinal and macular change over time. Genetic Testing: Genetic testing is used to help predict the severity and progression of a patient’s macular degeneration. The test involves using a cotton swab on the inside of the patient’s cheek with a gentle brush. The swab is air dried and sent to a lab for analysis. The results are then used to determine how frequently and aggressively a patient with macular degeneration should be monitored.